Actually, I’m kidding about the bumper sticker, but I’m serious about normalizing therapy. 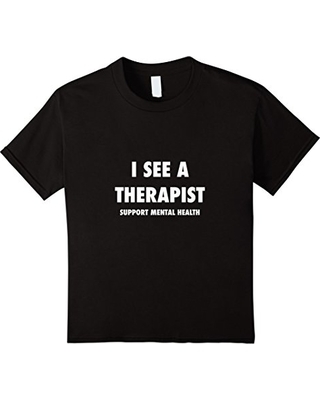 Why do I see a therapist? I want to discern my life patterns and figure them out with a wise person. When I’m really busy, it’s easy to lose perspective. I just started a new position in a new city away from family and old friends. I should probably talk about that with a professional. I have had a therapist everywhere I’ve lived since college – through deaths, break ups, births, and job shifts. It makes me a healthier person. And it’s different from coaching or spiritual direction – although I need those things too. Whether we are clergy people, mail carriers, electricians, educators, senators or stay-at-home parents, life can be busy/crushing/soul-sucking/wonderful. I, for one, need to process all that. How about you? Image of a t-shirt you can buy here. Amen. Professional therapy is what got me through my birth family revelations. I’m grateful to have insurance that covers therapy. Thanks Jan. I personally think everyone should be in therapy. And a 12 step program. And have to wear name tags all the time. That last one is selfish on my part, but it sure would make my life easier.